Minimalist shoes are more than a fashion statement on Pinterest. They’re the best way to protect your feet while feeling like you’re walking barefoot. Minimalist shoes are for people who want to trust their bodies to do what’s best. That includes trusting your feet to do things they do everyday like walking and running. Many shoes control our feet: they make them smaller, compact or protect them from damage. While these kinds of shoes feel good, they work against the natural mechanisms of our feet. This can cause damage over time, and affect our feet, backs, and legs. Minimalist shoes are sleek, lightweight, and designed to let your feet do their thing. To help you pick the best minimalist shoe for your lifestyle, we’ve made a list of minimalist shoes for women. How do you measure the difference in minimalist shoes? What Are the Advantages of Minimalist Shoes? Vivobarefoot is one of the leading brands for minimalist shoes, so you’ll be seeing them a lot on this list. What makes their Stealth Running Shoe so great? First of all, their synthetic sole is as thin as possible. They want you to feel the pavement on the soles of your feet while you run. This allows your foot to adjust to the ground in a natural way. This shoe also has a lot of room in the toe area. It lets your toes spread out naturally while you’re walking or running. The top part of the shoe is a thin mesh, which helps your feet to breathe. This also means that your feet will get wet easily if you’re running in the rain, but the soles still have traction. If you want to, you could wear this shoe without any socks. If you’re running in them, you might want to choose a thin crew sock. This can help with odor control and make your shoes last longer. There is no arch support in the Stealth running shoe. If you’re not used to that you need to take some time to get used to the shoe. Go for some walks before you take it out for your first run. Vivobarefoot’s Primus Lite Trainer is slightly different from the Stealth. They both have the same great breathable mesh top so your feet don’t get overheated. The sole is still incredibly thin, so you get the same “barefoot experience” plus the protection. The two biggest differences from the Stealth are in the soles and arch support. Primus has slightly more arch support than other minimalist trainers. They still want your foot to work the way it would without shoes, so the arch support is small. If you’re transitioning to minimalist shoes, arch support makes all the difference. The other difference is that the soles are rubber. This can give you more grip than other synthetic soles. It also provides more protection against the debris that shows up on city streets. To care for this shoe, wash it once a month. You can throw it into the wash, and it will come out clean and fresh. Like the Stealth, wearing socks with your Primus while running fights odor. Looking for a minimalist running shoe for your city excursions? The Vivobarefoot Women’s Stealth on Road Run Walk Shoe is for hard, flat surfaces like city streets. This shoe has a 2.5mm TPU outsole, which is the thinnest outsole that Vivobarefoot makes. You can remove the insole for maximum feel while you’re running out the door. This also gives the shoe the most flexibility out of all their running shoes. The top part of the shoe is Lycra and mesh to allow your foot to breath. The only problem is that because it’s made almost entirely from plastic, this shoe can get grimy. To solve this problem, Vivobarefoot created a special antimicrobial layer for their insole. This fights the odor-causing bacteria that happens with minimalist shoes. Because of the thin plastic sole, you should only use this shoe on hard, flat surfaces. That means all hiking and river walking is out. If you do take these on the trail, keep clear of the natural debris that could poke a hole in your shoe. Xero started as a brand on Shark Tank with their “Build Your Own Sandals” design. Now they’re another leading brand in minimalist footwear. They make all their shoes with vegan products, to protect the environment. The Xero Prio running shoe is made with your foot in mind. They created a running shoe with a wide toe box so that your toes can spread out the way they’re meant to. Like other minimalist shoes, the Prio has a low-to-the-ground sole so that you get a better feel for the ground. This increases your balance and awareness, no matter what you’re doing. Unlike road running shoes, Xero Prio running shoes are great for trails. The FeelTrue rubber is only 5.5mm. This way you can run over a rocky trail or a patch of pine needles without flinching. They also have reflective straps on the side, so running in low-light is easier. There’s also a removable 2mm insole if you’re worried about that extra cushion starting out. The Prio shoe is very light, so you can toss them in your bag without worrying about any bulky weight. Xero says that the Prio runs a little small, so if you get the Prio order a ½ size up. Look, we’ll say it so you don’t have to: some barefoot shoes look weird. Other than the idea of running barefoot, the “five-finger” model throws people off. That’s okay, not every shoe is for everyone. If you want the experience of minimalist shoes without the odd style, New Balance offers the WT10v1 Minimus Trail Running Shoe. This trail running shoe has a lot to offer. It’s made with a 4mm drop, with the patented Vibram outsole to protect your feet from the elements. The outsole still has flex grooves, so you have flexibility as well as traction while you’re outdoors. The outsole also has an upcurved toe cap. This helps with balance while running, and also helps the shoes last longer. This shoe also offers minimal arch support, with an Acteva midsole. If you’re transitioning from normal shoes to minimalist trail running, this shoe helps you make the leap. The WT10v1 Minimus also has odor protection technology, so you could wear them without any socks. If you’ve been running with minimalist shoes for a while, then you’re ready to dive into something more intense. The Merrell Women’s Vapor Glove 2 is your new trail mate. The rubber sole protects against sharp rocks or other debris, but everything else is there to simulate a barefoot experience. It has 0mm cushioning, as well as a 0mm heel-to-toe drop. The top lining is a colorful mesh to help with ventilation. On top of that, they use a lot of sweat and moisture wicking technology. The M Select Fresh antimicrobial shield fights odors that happen while running, even if they get wet. Speaking of, this shoe is not water-proof, so if it’s wet outside expect a little moisture. The outsole does have great traction, so at least you won’t go slipping and sliding. Despite the breathability of the mesh top, it holds heat better than other models. This will help you if you’re in colder climates because your feet and head are the two places where heat escapes the most. Like Xero shoes, Merrell creates their shoes with 100% vegan materials. When it comes to hiking, it’s important to feel the trail under your feet. You want as much balance as possible while you’re rock hopping, so minimalist shoes are perfect for this. Xero creates an attractive hiking shoe called the TerraFlex. Again, they use their FeelTrue rubber sole to get your foot as close to the ground as possible. They also create the shoe with lots of room in the toe box so your toes can move in the way that’s most natural for them. Unlike their runners, this Xero shoe has a 4mm lugged sole to give you some traction. This traction is important when you’re going up and down the rough hills on the hiking trail. There’s also a 3mm BareFoam layer that will smooth out rough spots while you’re hiking. Plus there’s a Tough Tek toe bumper so that going uphill and stubbing your toe won’t be as painful. The top part is mesh to allow for breathability. It isn’t waterproof, so if you slip in the river you’re still going to get wet. But the soles are slip-proof and made of rubber, so you’ll still be able to hike even after getting them wet. The Xero TerraFlex is for hiking on the trails. JOOMRA Women Wide Quick Dry Hiking Water Shoes are great for hiking and water sports. Like the TerraFlex, JOOMRA’s shoes have a rubber sole for protection and traction. They’ll keep your grip even after getting wet while hiking or kayaking. The top part of the shoe is also unique. It’s made with the same breathable fabrics as most minimalist shoes. 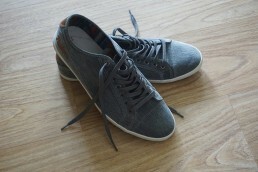 Instead of laces though, it has an easy No-Tie slip-on feature. The toe guards have a five-toe design. This guides your toes to the right position instead of constricting them in a tight toe box. The coolest feature of the JOOMRA shoes are the drainage ports at the bottom of the sole. There are three fan-shaped mesh parts on the bottom of the shoe that drains any water that’s trapped inside. That means it’s also easy to dry these shoes out. While most shoes are still damp by the next day, JOOMRA’s water shoes are ready to go by the next day. This great feature makes it easier to have a comfortable hike no matter what. If you’re into Crossfit training, then you might’ve heard of the NOBULL women’s training shoe. NOBULL wants to give you the kind of minimalist shoe that will work inside and outside the gym. The toe box is nice and wide, which helps your toes during your planks and burpees. The soles also have a good grip, so you’ll be fine in the gym and during your cardio routine. There isn’t as much support as the Nike Metcons, but that’s why you’re looking at minimalist shoes in the first place. You want a good training shoe that gets your feet close to the ground. The tongue of the shoe is long, so you might want to use them with crew socks if you don’t want a blister. Other than that, it’s a well-constructed shoe for HIIT or Crossfit training. On top of all that, they’re really good looking shoes! You can get them in many different color combinations, like purple camo, bright blue, or normal black. The NOBULL logo on the side is reflective, so you can work out in low light without any worries. Reebok claims to be the “Official Shoe of Fitness.” Their Crossfit Nano 4.0 Training Shoe aims to be the only shoe you’ll need for your HIIT training. The Crossfit Nano allows your feet the same flexibility as going barefoot. The MetaSplit outsole gives you enough room for great foot splay, while the heel to toe is only 4mm. They even updated the outsole to have a better grip for rope climbing, an exercise that’s hard enough without having your feet slide all over the place. Your feet will feel nice and snug with their Duracage technology and lace closures. The open-weave mesh tops give you better fit and ventilation for hot workout days. There’s even a removable mesh sock liner with extra cushioning for the days your feet aren’t feeling 100%. All these features make for a great weightlifting shoe. You can feel get a feel for the ground without worrying about slipping on the mat. But unless you’re used to minimalist shoes for running pack another pair for the cardio part. You can build up your foot strength so that eventually your foot is ready for a full minimalist workout. Are you ready to take your minimalist shoes into your everyday routines? Then you need Vivobarefoot Women’s Jing Jing Slip-Ons. These 100% leather slip-ons have a synthetic sole like Vivobarefoot’s Stealth Running Shoe. They’re made for work, as well as after-work activities like dancing or walking. The heel measures about 0.25”, and has the same technology as other minimalist shoes. The wide toes and thin outsole means you can still enjoy the feeling of not wearing any shoes while you’re at the office. The sole is a honeycomb pattern for gripping on everyday surfaces. The top line has elastic to make it easy to slip on and off. Vivobarefoot recommends that you size up when you buy one of these shoes. The elastic on top is tight to keep the shoe on your foot better. If you don’t get the right size, you’ll have a problem with the elastic cutting into your foot. The Jing-Jing’s come in black leather and brown suede, so they’ll match any outfit you pair them with. Vivobarefoot has other work-friendly street shoes. They have the same barefoot comfort as their trainers. If you’re into casual street shoes, you might have seen wool trainers on social media. This popular material is making its way into sneakers. Why? For the same reason, it’s a popular jacket liner. Wool is light, all natural, and good at regulating internal temperatures. It’s also moisture wicking and antimicrobial. That’s why Xero decided to combine wool tops with their Barefoot sole design in the Pacifica shoe. The Pacifica shoe comes in two popular colors, Charcoal and Merlot. They’re a great option for casual winter shoes, so you can look cool and still let your feet do their thing. Like all other Xero trainer designs, the Pacifica has a wide toe box and zero drop sole. The wool top is super lightweight, so when you combine that with the FeelTrue thin soles it’s like you’re not wearing any shoes. The Pacifica is also barefoot friendly. This means you don’t have to wear them with socks. The smooth moisture-wicking lining will protect your feet from feeling sweaty and keep them toasty. Like other Xero shoes, these run a little small. Go up ½ a size, and you’ll have the most comfortable shoes in the neighborhood! You’ve gotten the idea that minimalist shoes “let your feet do their thing.” What does that mean exactly? Minimalist shoes have a high amount of flexibility, low heel to toe drop, stack height, and weight. They’re made this way to allow your feet as much freedom as possible to move, walk, or dance without actually being barefoot. They don’t have any stability devices or motion control. Minimalist shoe designers believe your foot is the best device for all of that. Weight – The best minimalist shoes weight less than 4.4 oz. The most they can weight is about 11.5 oz. Stack Height – The stack height measures your shoe sole at its thickest part, which is the center of the heel. Minimalist shoe designers want a low stack height to get your foot as close to the ground as possible. If the sole is less than 8mm, you’re looking at a great minimalist shoe sole. The thickest it can be is 32mm and up. Heel-to-Toe Drop – The heel to toe drop measures the difference between the heights of your heel in a shoe to the height of the toes. The difference plays a role in where you foot strikes when you’re running. Minimalist shoes want you to strike at the forefront of your foot, so it has a low heel-to-toe drop. It should be from 1mm to 13mm. Flexibility – The flexibility of your shoe plays a role in how you foot moves while walking or running. A good minimalist shoe can easily fold up when you press the hell and the toe together. It also twists easily when you rotate the heel and toe in opposite directions. Protection – A lot of modern shoes have features like rigid heel counters or elevated insoles under the arch. Minimalist shoes do away with all that. They want the best feature of your shoe to be your foot, and that’s it. The main argument behind minimalist footwear is that our modern sneakers and shoes have allowed our feet to become lazy. Instead of developing strong foot muscles, we cover them with clunky shoes and thick insoles. Minimalist shoes seek to reverse all that. These manufacturers believe that the foot is one of the best tools our body has for getting around. They wanted to create a shoe that strengthens our ligaments, tendons, and muscles. Why not go barefoot instead? Well for one, many of us live in cities or in towns with paved roads. This can make the ground hot, which burns the bottoms of our feet. There’s also litter and debris that you have to consider. Minimalist shoes are the next best thing to walking around barefoot. They’re also engineered to help your foot strike at the forefront of the foot rather than the heel. This way of running is better for long-distance running. It’s also a lot easier on your hips if you’re running with the forward momentum of your body instead of against it. By taking away the cushioning of your shoes, you’re also engaging the muscles in your ankles and legs. This can save you a lot of pain, like shin splints or rolling your ankles. This also gives you better balance while you run, hike, or practice yoga. Better balance will help your posture and strengthen your back muscles. It also gives you a better sense of connection with your surroundings. Beyond the physical advantages of minimalist shoes, they look good. The toe box may be wider, but everything else about minimalist shoes is sleek and attractive. They’re also light and flexible. That makes them much easier to pack in your gym bag or purse if you go to the gym after work. With all these advantages, why wouldn’t you want to try minimalist shoes? It’s easy to read about minimalist shoes and want to dive right in. After all, you want your feet and legs to be strong, right? Slow down, friends. If this is your first pair of minimalist shoes, you need to take a few things into consideration. Most traditional shoes have stiff soles that protect the plantar fascia. This is a strong band of connective tissue that lines your bottom feet. If you choose to wear minimalist shoes without any cushioning or socks, there’s a chance that your plantar fascia will strain. This leads to plantar fasciitis, which will put you out of commission for a while. There’s also a huge chance that the skin of your soles is soft. That’s normal for most of us. We’ve worn shoes all our lives, so there was never a need for our feet to develop tough calluses. Because of our sensitive feet, you might experience some blisters while your feet get used to running in minimalist shoes. Yes, you still have soles on the bottom of your feet, but traditional shoes have at least 33mm soles. Minimalist shoes have 8mm or less. There are a few things to look for in minimalist shoes to help you transition. The first is fit, the heels and toes of your shoes should feel snug. The second thing you can do is to wear socks. This will help with cushion and blister protection. Lace-up shoe closures can also help you if you’re getting used to the lack of arch support. The lace closures give you more control over how tight your midsection is, and how high the arches are. Transitioning from traditional shoes to minimalist shoes can take a while. It might even take you a few months to get used to them! But with patience and practice, you can make a switch that your feet will thank you for.